Best Practices for Building Ultra-Low Latency Microwave Networks. To achieve the lowest end-to-end Ultra Low Latency with the highest possible reliability and network stability not only requires a wireless transmission platform that supports cutting edge low latency performance, but also must be combined with the experience and expertise necessary to design, deploy, support and operate a Millimeter wave, Free Space Optics or Microwave transmission network. In High Frequency Trading (HFT) applications where computers can make millions of decisions in fractions of a second, receiving data even a single millisecond sooner can equate to a distinct advantage and generate significant profits. This is called Low Latency or Ultra Low Latency networking. According to Information Week Magazine¹: “A one (1) millisecond advantage in trading applications can be worth $100 million a year to a major brokerage firm”. Currently electronic trading makes between 60% and 70% of daily volume of the New York Stock Exchange. Tabb Group, a research firm, estimated that High-frequency traders generated about $21 billion in 2008. Financial Trading centres with HF Traders can be in locations separated by long distances for example Chicago and New York. Data communications between these locations is commonly over leased circuits on fibre optic networks. But if the data was carried over Microwave radio links between the same two locations it would arrive several milliseconds earlier. Why? Optical, Millimeter Wave and Microwave signals travel through the air about 40% faster than light through optical fiber. Latency in a data communications circuit, or the time difference between sending a request for data and receiving the reply, will consequently be longer over a fibre optic circuit than a microwave circuit of the exact same length. Latency is largely a function of the speed of light, which is 299,792,458 meters/second in vacuum. Microwave signals travel through the air at approximately the same speed as light through a vacuum and will have a latency of approximately 5.4 microseconds for every mile of path length. Light travel in optical fibre has latency of 8.01 microseconds for every mile of cable, due to the refraction in the fibre. When data has to travel over 1400 miles from Chicago to New York and back again the latency difference due to the communications medium alone is more than 3.5 milliseconds. Straighter Routes Microwave networks have shorter routes, reducing the total network distance and consequently further improving latency. Microwave links can overcome topographical obstacles such as rivers, mountains and highways while optical networks in many cases have to go around them or follow existing roads or bridges. In general, signals over fibre networks have to travel farther and thus take longer to get to their destination. Total latency in any network includes additional latency due to data queuing delay, processing delay through gateways, network design, equipment configuration and extra distances due to circuitous routes. Overall, CableFree Millimeter wave (MMW), Free Space Optics (FSO) and Microwave networks offer a better solution for Ultra Low Latency applications such as HFT in comparison to fiber optic equipment because of a combination of an advantage in transmission medium and simple geometry—shortest distance between two points is a straight line. 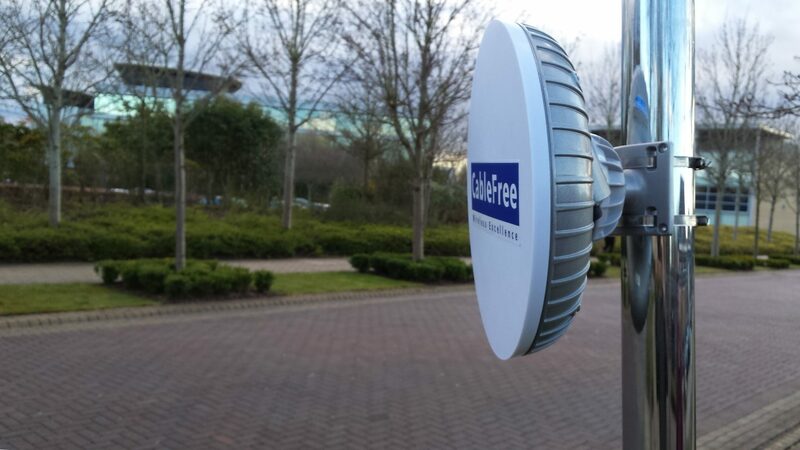 The CableFree product range includes specific Ultra Low Latency versions of Microwave, Millimeter Wave (MMW) and Free Space Optics (FSO) products which reduce the latency per-hop and per-terminal to under 20 nanoseconds per terminal, using special low latency techniques.